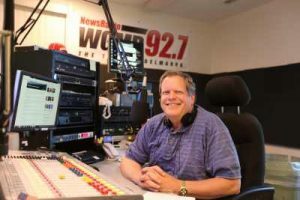 Duke Brooks, host of “Radio Free Delmarva” every weekday from 3 til 6p and Saturdays from 9 til Noon, was educated at the William Penn Charter School in Philadelphia and at the prestigious Newhouse School of Public Communications at Syracuse University. His aviation background launched his career as a traffic reporter in various east coast markets. Duke’s talent has been utilized as an on-air music host, radio advertising sales representative, station manager, commercial real estate agent and spokesperson for the Sussex County G.O.P.